This past Monday we started a long overdue tiling project. For the past three years, ever since our remodel was complete and we moved into our condo, the lowest point in our shower has not been the drain. 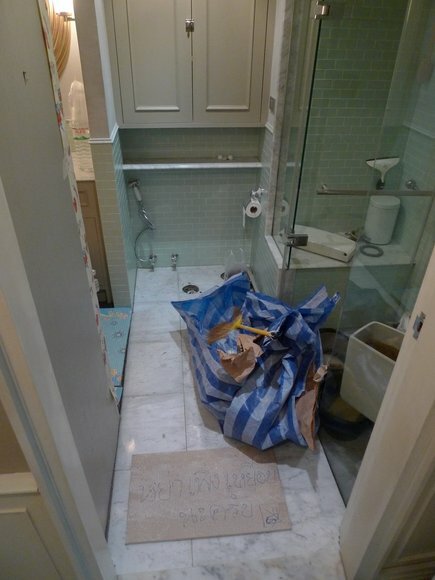 For a variety of reasons, the original contractor seemed unable to construct a well thought-out shower and his workers were unable to install marble tiles on the proper angles to ensure drainage. 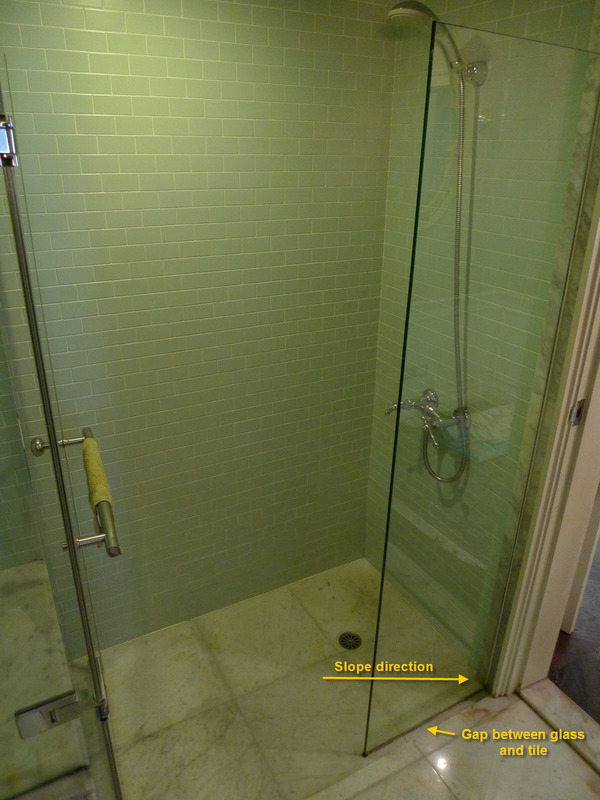 In the old arrangement, there was a gap between the glass and the raised portion of tile outside the shower. The rationale behind this is that a 1/2-inch diameter pipe connects the lower tiled area in the shower with the tiled area beneath the stacked washer and dryer, about five feet to the lower right of the picture. The connection was designed so if the drain for the washer backed up, the overflowing water could flow to the shower. 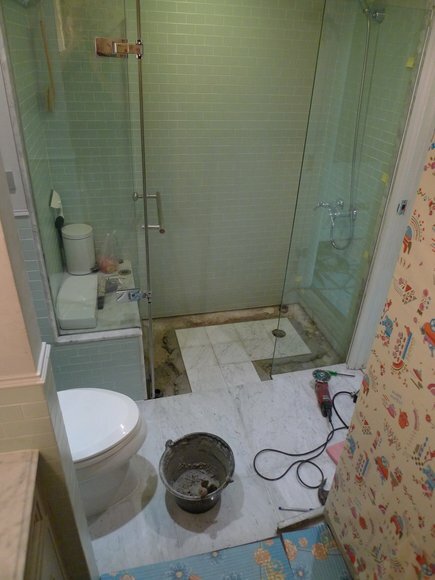 Good concept, but the contractor didn’t make sure the shower was lower than the area where the washer is. For three years, we’ve had to use a squeegee and a spare towel after every shower to clean up the water that accumulates in the corner of the shower and at the end of the gap, close to the door sill. Not only was this annoying, but despite our best efforts there was seepage of the water into the concrete. The brown stains in the marble tile come from seepage, where the moisture pulled the stain from the wood floor in the hallway. 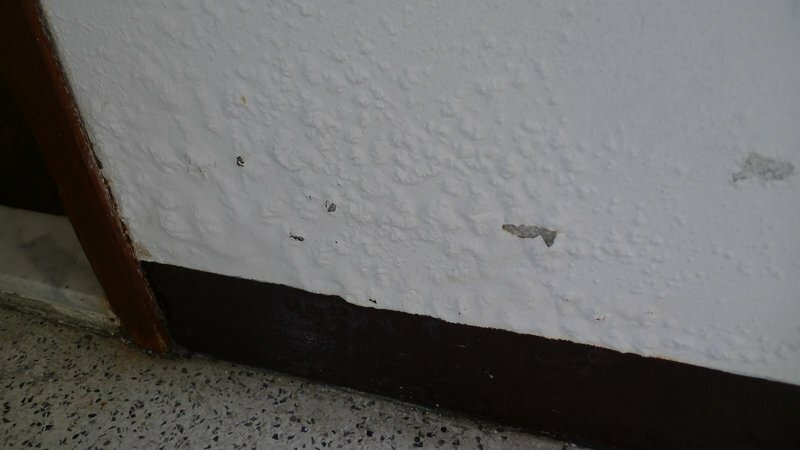 Not only was the damage cosmetic, but the exterior wall of the unit, which backs up to the shower, started to show signs of moisture and the paint began to blister. Finally, we were able to coordinate with Chang Dii (nickname meaning “Good Handyman”), the handyman who often works for Tawn’s father. His reputation is very good and after being burned by our contractor three years ago, we wanted to work with someone reputable. Monday seemed to be an auspicious day to begin our project, as it was the day the condo’s pool was reopened after a two-month re-tiling project. I guess it was auspicious because the pool project finished on time, not because it took two months! Precautions to keep the dust from the project safely confined to one area of the house were extensive. All the cabinets in the bathroom were emptied. Padded floor cover was laid on the wood. 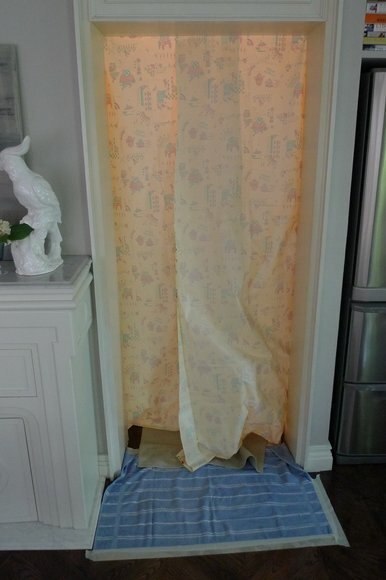 Sheets of plastic tablecloth (bought off a roll at Carrefour) lined the doorway into the bedroom and covered the main cabinets and washer and dryer. Additionally, towels stuffed the crack under the door. From the main hallway (which is the location of the bathroom’s main entrance), we put up more plastic tablecloths as a dust curtain, and laid down heavy towels to clean our feet as we passed through the portal. It made the space feel very compartmentalized. 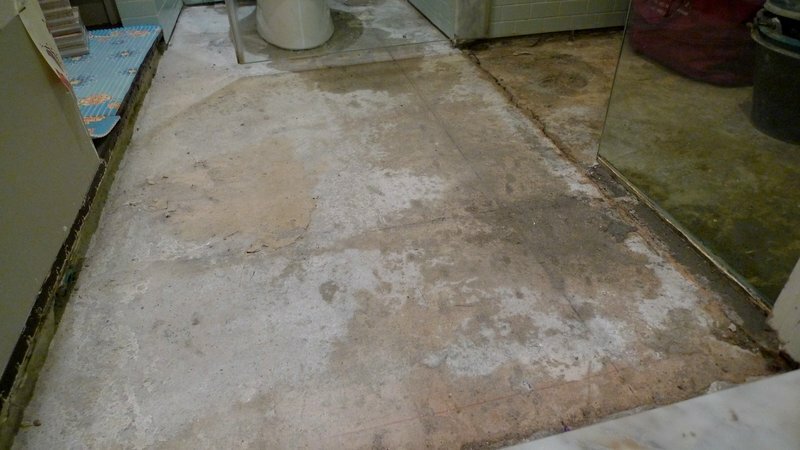 Three hours later, the tile and previous cement was removed and neatly cleaned. The pipe that connected to the washer area had been removed and the remaining bit to the left plugged. We’ll take our chances that a washer drain overflow is relatively unlikely. Another problem we had dealt with from the earlier contractor is that the edge between the tile and the raised wood area had never been finished. The underside of the wood flooring was exposed. Thankfully, Chang Dii fixed this in the end. 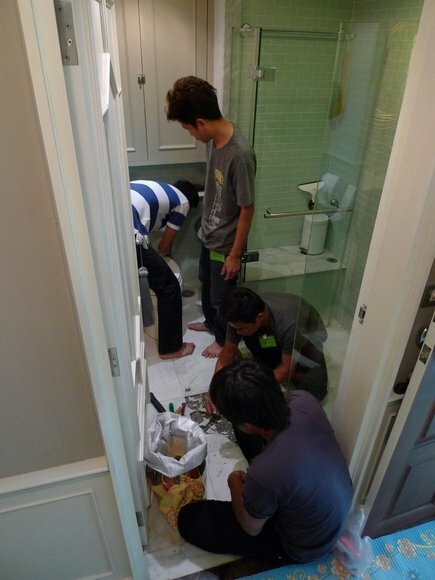 Late Tuesday morning, Chang Dii and part of his team returned to begin cutting and installing the marble tiles. 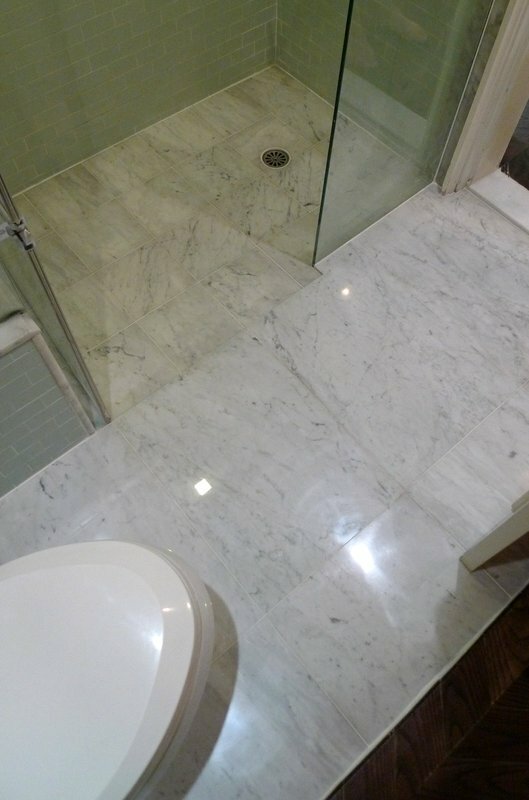 To save money (and get the best of both worlds) we bought ceramic tiles that have a thin layer of marble on top. The beauty of marble but the structure of ceramic. 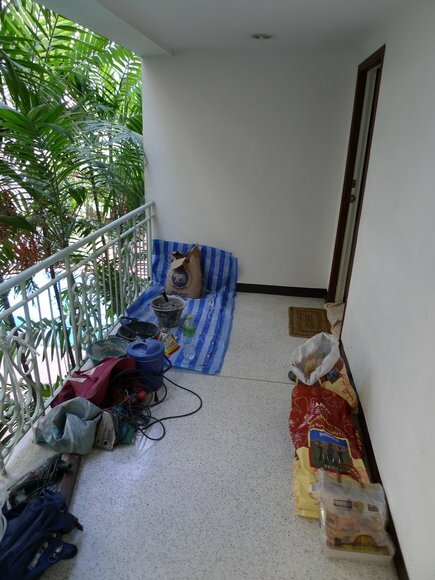 Chang Dii explained that the problem we were having with the water wasn’t just that the slope of the shower was wrong, but that the contractor had installed the tile in a “dry manner” – adhering the tiles on top of already dry cement, leaving gaps for the water. 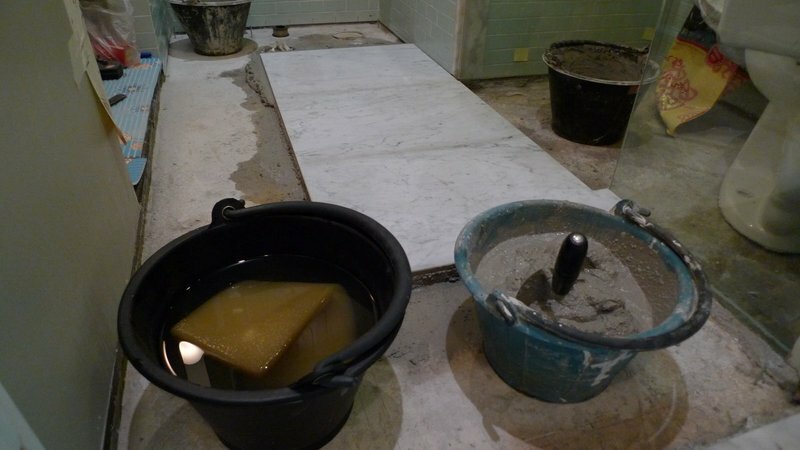 He chose to instead use a “wet manner” – placing the tiles directly on the wet cement and carefully leveling them, to minimize the risk of any gaps under the tiles. At the end of the first day, they had completed the wet area outside the shower. The area is now slightly higher than it originally was. 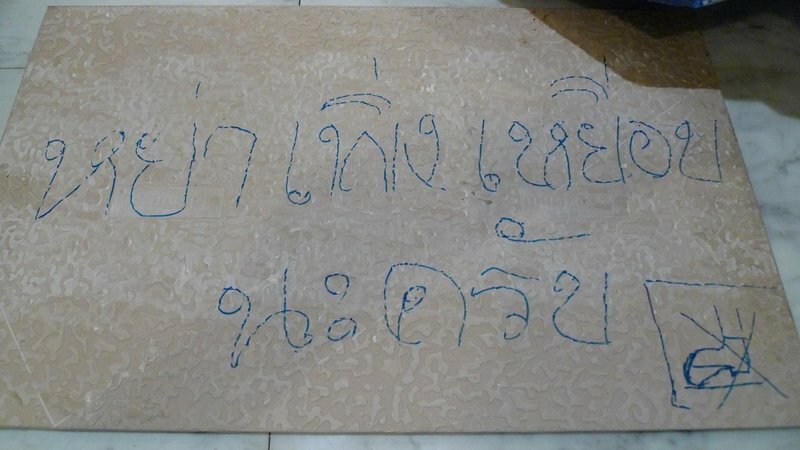 Since the tiles were floating on wet cement, it was important not to step on them for several hours, so Chang Dii wrote a sign for us. Now, I’ll let you know that his Thai spelling is as bad as mine. But just in case I couldn’t understand Thai, he included the international graphic for “No Stepping”. Which, upon closer inspection, I thought showed his attention to detail and clear understanding of the potential for mis-communication. The original foot is floating above the floor, suggesting perhaps that no levitation is allowed. 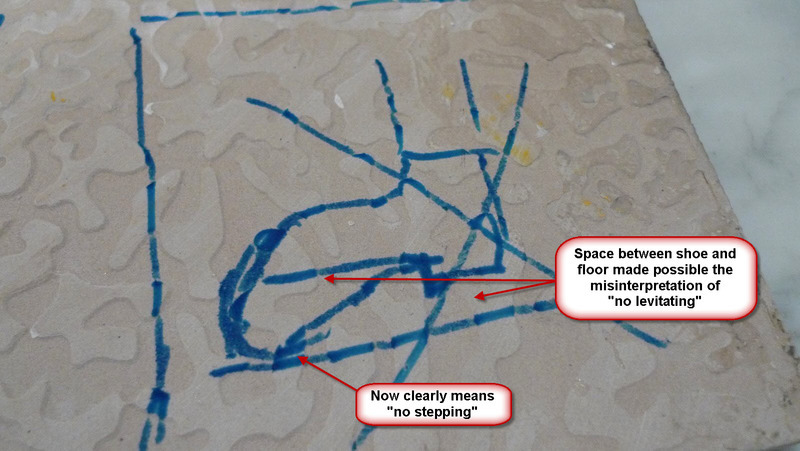 So he amended the drawing to bring the (now huge) toe into contact with the floor. Halfway through Wednesday, the third day of Tawn and me having to take our showers and use the toilet next door in the second unit, which we call The Annex, careful progress was being made on the shower tiles. His guarantee: every drop of water would go down the drain. The workers actually did a very good job of keeping their workspace neat and swept the entry hallway thoroughly each evening before heading home. By the time the project was finished, there was no noticeable dust in the living room or bedroom area. By the end of Wednesday, all the tile was laid, except for the door sill. We originally weren’t going to change this but it was stained brown from the nearby wood. We called a local stone company and ordered a piece and one of the workers went out to fetch it. At the end of the evening I noticed the marble, which Chang Dii had trimmed to fit better, appeared to be nearly a centimeter (about 3/4 of an inch) too short. Tawn and I discussed this and decided it was worth spending $20 on another piece of marble to make sure the work was done correctly. Thursday morning I shared my concerns with Chang Dii and he admitted, sheepishly, that his men had cut too much from the piece. Mai pben rai, I said – no worries. By lunchtime the replacement piece was on site and being carefully cut. By Thursday evening we were able to use the shower and toilet again, enjoying a nicely finished tile job. The gap along the glass is gone, the water drains wonderfully in the shower, and even the connection between the wood and the tile area has been neatly caulked. All in all, an excellent job. Hopefully, the moisture that has previously seeped into the walls and floor will quickly dissipate and cause no lasting damage. 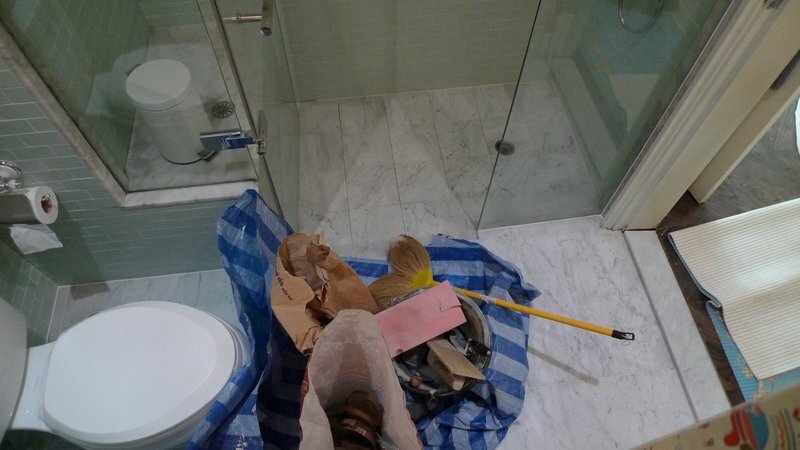 As for the question that comes up often – “When are you going to connect the two units?” – the hassle involved with just changing the tile in a single bathroom serves to remind me how not eager I am to undertake a larger remodel and joining of the two units! This entry was posted in Uncategorized and tagged Bathroom, condo, Home, Project, Remodel, Rennovation, Retile, Retiling, Tile by christao408. Bookmark the permalink. I love the good humor displayed by all! A lovely result too! Now about that remodel job… seems that I’d hire this fellow to do the job – if or when you undertake that project! Chang Dii seems to be a very good handiman. Quality work, clean and on time. If by any chance, he decides to move to LA, please let me know. 🙂 The remodelled shower surely looks very nice. Looks beautiful! I think he did good with your help and watchful eye. This just proves to me once again that good writing can take you on a great journey. Your post is wonderful and I enjoy visiting your bathroom very much. The tile work looks perfect. Now there are no worries when someone is taking a shower! By the way, how much is the labor, just curious? Too bad the original contractors goofed it up so royally. I am glad that you have perfect now. Looks very neat and professionally done. I totally share the same concerns with you about renos! I love reading about and watching reno projects on tv, but I the idea of dust and botched home improvement holds me back from doing anything significant in my condo! ah yes; the joys of renovations! 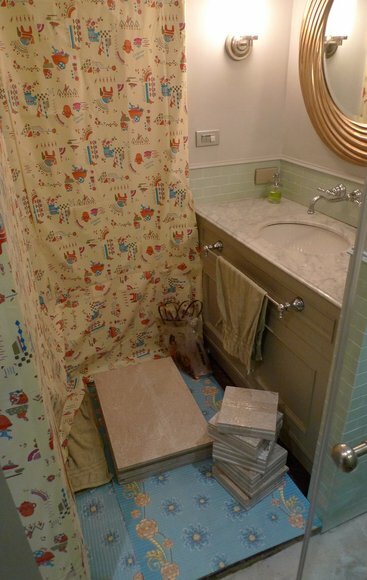 Good choice of tile – we have the exact same ones in our master bathroom! I’m sure that is the international symbol for no toe tapping (typical farang impatience?) hee hee…Wow… the only thing you folks didn’t do was to have a hepa air filter and negative air pressure to ensure all the dust remained in the washroom. I’m glad things worked out. I don’ have a bath tub in my bathroom – just shower stall like yours. Although yours is a lot nicer. Ah remodeling and construction. Ain’t homeownership wonderful? the finished bathroom looks great! i would hate to have workers underfoot all the time. I like that international graphic of “No Stepping”! Why do you have two units? Is it because one unit is too small? I love the no levitating/stepping sign 🙂 Too funny!Love the new bathroom! Nice to know it’s all done. 🙂 And you never told us you could levitate. 😛 Is it some Thai Buddhist secret?